Q: Why didn’t my chocolate ever set up? A: It could be that your room temperature is too high. Candies need to be dipped and then left to set in a room that is between 65 and 68 F.
It could also be that the chocolate wasn’t tempered. Untempered chocolate takes quite a bit longer to set. Q: Why are there white streaks or splotches on my chocolates? A: This is a difficult question to answer because it can be a couple of things. 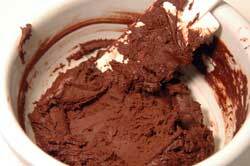 If grainy streaks appear over time, it could be caused from not adding enough seed chocolate during tempering. (Read our tempering post for more info.) If the streaks appear very soon after the chocolate sets, it’s probably caused by the cocoa butter not being fully integrated with the cocoa solids. Solution: stir, stir, stir. You can also get streaks or splotches from temperature changes. 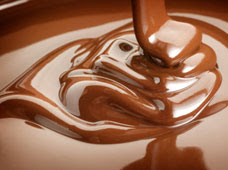 Chocolate needs to set at a temperature between 65 F and 68 F. If you put it in the fridge to cool and set, when you take it out, condensation will appear on the surface of the chocolate. This water will pull sugar crystals to it and cause what is called sugar bloom. If you want a more in-depth read, click here and here. Q: What is this white film on my chocolate? A: This white film is called fat bloom. 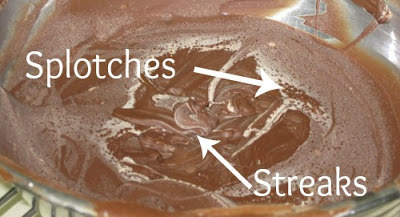 One theory is that fat rises to the surface of the chocolate through microscopic cracks. Sometimes fats in the centers will creep out to the surface. This is most common with chocolate covered nuts. Warm storage conditions can also cause fat bloom. While it looks less appetizing, it’s perfectly fine to eat. 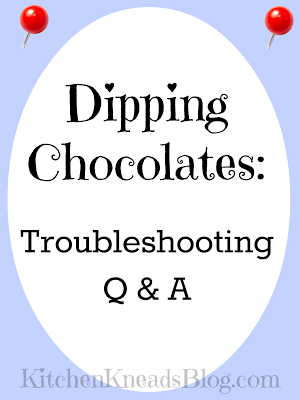 Q: When I was melting my chocolate, it globbed up and went hard. What happened? A: There are two things that could have happened. First, you might have gotten water in it, causing it to seize. Despite the appearance of melted chocolate, it’s actually a very dry substance. There’s no water in it. Think of it like this- What happens when you put a drop of water in a bowl of sugar? The sugar crystals cling to the water and glob up. It’s the same thing with chocolate. Get water in it and the chocolate crystals cling to it, causing hard clumpiness. At this point, is your chocolate ruined? Yes and no. You won’t be able to use it for dipping, but if you add enough liquid (milk, cream, or water) it will thin back out and you can use it in baking or for hot chocolate. It’s just like adding more water to the sugar. If you add enough water, the sugar crystals will dissolve and you’ll have something you can work with again in a different application. The second thing that might have happened is that it burned. Your heat was too high or you didn’t stir it enough while melting it. Is your chocolate ruined? Well, yes it is. There’s really no retrieving burned chocolate as far as we know. 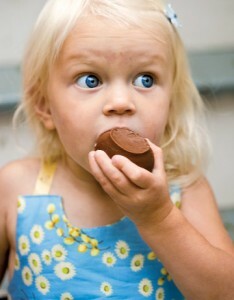 Q: Does humidity affect chocolate? A: Yes, yes it does. We learned this one the hard way. While trying to cool the house down quickly on a rainy night in preparation for dipping, we opened the windows. Not to mention the pot of soup on the stove simmering away for dinner. Lots of humidity. Dipping went on, but as the chocolate was setting, it formed tiny speckles. Not the splotches mentioned above, just tiny little speckles that almost look like fat bloom from a distance. The chocolate set up fairly quickly, but was kind of soft and melted easily when touched. Chocolate needs to be dipped in 50% or less humidity. It really shouldn’t be too much of a concern. Just don’t open your windows when it’s raining or dip right after a pot has been simmering on the stove. Be aware of the humidity, but don’t obsess over it. Q: What’s the best way to melt chocolate? A: There are a few ways to melt chocolate and it really just depends on who you are and what you like. There are people who swear by the microwave; heating it at 50% power at 30 second intervals. Others love the double boiler. It decreases the chance of burning, but be careful when working with chocolate around water. Still, others like to melt in a thick-bottomed pan directly on the stove top. With this method, you need to constantly stir it over very low heat. Be careful not to burn it. A lesser known way to melt it is in a glass bowl with a heating pad between it and another larger bowl. This is a super slow method for melting, but consider it for keeping your chocolate at a good dipping temperature. We’ve also heard of people putting their chopped chocolate in a bowl and sticking it in a gas oven, letting the heat from the pilot light melt it. Think about this: if you melt your chocolate so gently and slowly that it never gets above 89 F it will not need to go through the tempering process because it hasn’t lost its temper. Of course, this depends on the chocolate too. Consult the manufacturer for verification. We do know that Peter’s chocolates will stay in temper if not heated above 89 F.
Q: Can I use chocolate chips? A: Well…we wouldn’t. First of all, chocolate chips have a higher viscosity (they’re thicker when melted), so they’ll coat really thickly. But mostly we wouldn’t use them because they’ve had things added to them to help them retain their shape during baking. So, you could use them, but it won’t turn out the same as if you use dipping chocolate. Q: Who ate all my chocolates? A: Well, that’s a tough one. They were so delicious. 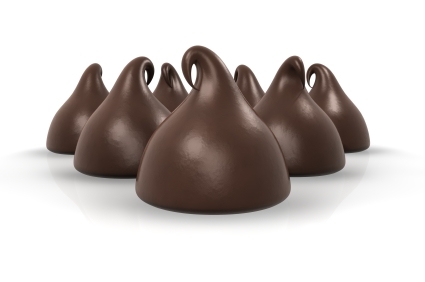 We hope this helped solve your chocolate woes. If you still have questions, we’d love to answer them in the comments section below. Great help for chocolate! thanks! I’m having trouble with soft truffle filling. If I freeze it to dip they either crack or my temper isn’t glossy … suggestions? I love the taste of Symphony Bars by Hershy. I use them to make my turtles. The problem I have it that no matter what I do or how slow I melt the chocolate after I have finished making them, within a few days I get a white substance on the top of my turtles. Is there something I should add to my chocolate so that this will not happen? Your solution is going to depend on what kind of white substance is forming on top. Is it white streaks? If so, it could be that you didn’t stir it enough while tempering. Is it splotches? If so, it could be the temperature at which your chocolate is setting up. Chocolate sets up best between 65 and 68 F. Is it a white film? If so, this is called fat bloom. It’s caused by fat rising up to the top of the chocolate through microscopic cracks. This happens most when nuts are involved. Since I don’t know exactly what kind of white substance you have, my best suggestion is to read carefully through this post again and do some trials to see what your solution might be. Best of luck to you!